Our personalized soap/ lotion dispensers are decorative, functional and perfect accents for any bathroom or bedroom. The fun patterns and vibrant colors are great for all ages, and the adorable designs can be an incentive to get your litte ones to wash their hands. We can personalize them with one or two names so that they can be used in an individual or shared space. 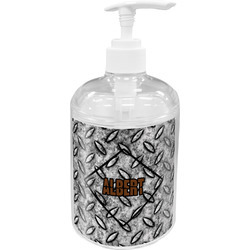 The soap dispenser is sturdy acrylic, with a a twist off lid for easy filling, a durable pump for controlled dispensing, and holds 9 oz. You can fill it with soap, lotion, or anything else that you would like to dispense with a pump. my 4 y/o who loves trains was so happy seeing this in his new bathroom. Thank you! Very happy with product , really suitable for its purpose. it was cute but not worth the cost. It's made of cheap material. You're better off creating your own graphics and buying a soap dispenser from the dollar store. Overpriced not worth the cost.